SITUATION: Since 1965, ElectriCities of North Carolina has been the energy behind public power, partnering with our valued members throughout the state to provide safe, reliable power to 1.2 million people across North Carolina. Our know-how, resources and expertise are part and parcel of how we have been able to deliver superior service to that end, day in and day out, for more than 50 years. One of our goals as an organization is to take the time to shine a light on the fine folks who make delivery of that superior service possible. SOLUTION: Each October, we recognize the hardworking men and women behind the scenes who help to keep the lights on and keep our cities up and running with a week-long celebration known as Public Power Week. It’s just our way of giving them the well-earned praise they deserve for a job well done. This annual tradition is made extra special with themes promoting the value of public power, cheerful festivities and unique, custom designed keepsakes. 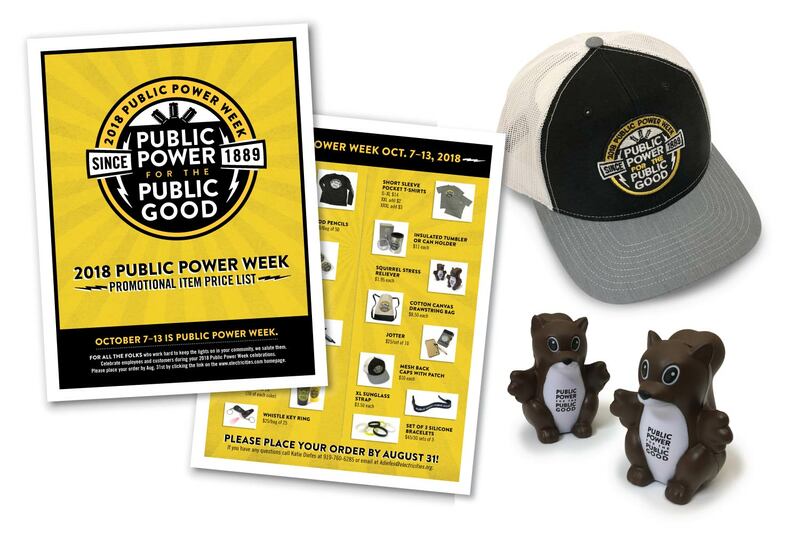 RESULT: The theme for this year’s Public Power Week celebrations, “Public Power for the Public Good” was featured on T-shirts, keychains, ballcaps and other paraphernalia, as well as several items that showcased our official mascot, Sparky the Safety Squirrel to mark the occasion. All made available for use by public power communities throughout the state with the aim of commemorating the moment for old time’s sake.